Wishing you all a Happy Holi ! We are glad to share this edition of our Digest. The country has witnessed a round of elections in some of the states and it does seem that the voter has voted above the framework of caste and faith. As is being rightly said, a voter is trying to usher in a new era of hope and positiveness. A major change that seems to be occuring is the assertion of the Muslim woman who is taking up the cause of fighting against the draconian practise of Triple Talak. Aero India 2017 provided a significant platform in bolstering business opportunities in International aviation sector. It has favourably poised an exponential growth over previous edition. A rapidly growing economy, defence preparedness challenges and opening up of defence production to private sector, have given a major fillip to the defence industry in India. It has also become a hub centre for defence business in the Asia. Communism captured power in Kerala in 1957 and since then ideological opponents are physically targeted and killed. About 270 nationalists have been murdered in Kerala. Over 82 of them have been murdered in Kannur district alone. Supplementing this dance of death, there is a police torture and false cases, especially when CPM/LDF grabs power. Vimala – 28th December 2016 – Burnt alive with other relatives. Locked in the house which was set ablaze. A relative and her husband died on the spot. Vimala struggled with third degree burns and died in the hospital. Santosh – 18th January 2017 – CPI-M hoodlums waylaid him near his house, in the constitutuency of the chief minister, Dharmadam, and hacked him to death. Nirmal –12th February 2017 – A 21 year old nationalist youth killed brutally. K. Ramachandran – 11th July 2016 – A labour leader murdered before the eyes of his horrified wife in broad daylight. P. Chandrasekharan – 4th July 2012 – former CPM worker – killed without remorse or pang of conscience. Do share your feedback and suggestions on the posts. This entry was posted in Newsletter and tagged AriseBharat Digest, Aurangzeb and Kashi temple, Communists in Kerala, Kashi Temple on March 12, 2017 by arisebharat. 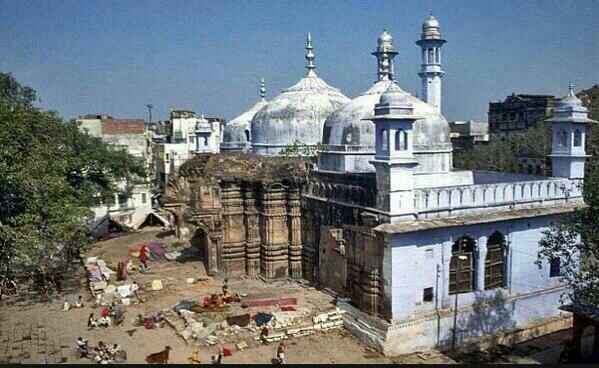 Why did Aurangzeb Demolish the Kashi Vishvanath? During the Ayodhya controversy, there were occasional statements in the Hindutva camp confirming (VHP) or denying (BJP) that apart from Ram Janmabhoomi, two other sacred sites should also be “liberated” from Islamic “occupation”: Krishna Janmabhoomi in Mathura and Kashi Vishvanath in Varanasi. Though the Hindu business community in central Varanasi has made it clear that it refuses to suffer the inevitable losses which would accompany an agitation in their densely populated neighbourhood, the liberation of Kashi Vishvanath is still on the VHP’s agenda. Therefore, some authors have tried to “do an Ayodhya” on Kashi, viz. try to make people believe that there never was a Hindu temple at the disputed site. Syed Shahabuddin asserts that Muslims cannot possibly have destroyed any Hindu temple, because “pulling down a place of worship to construct a mosque is against the Shariat”; claims to the contrary are all “chauvinist propaganda.” Arun Shourie has confronted this claim with the information given in the official court chronicle, Maasiri Alamgiri, which records numerous orders for and reports of destructions of temples. Its entry for 2 September 1669 tells us: “News came to court that in accordance with the Emperor’s command his officers had demolished the temple of Vishvanath at Banaras” . Moreover, till today, the old Kashi Vishvanath temple wall is visible as a part of the walls of the Gyanvapi mosque which Aurangzeb had built at the site. In the face of such direct testimony, it is wiser not to challenge facts headon. It is better to minimize or to justify them. Thus, Percival Spear, co-author (with Romila Thapar) of the prestigious Penguin History of India, writes: “Aurangzeb’s supposed intolerance is little more than a hostile legend based on isolated acts such as the erection of a mosque on a temple site in Benares.” But a perusal of the same Moghul chronicle thoroughly refutes this reassuring assertion: Aurangzeb had thousands of temples destroyed. And other chronicles, diaries and other documents concerning Muslim rulers in India prove that the practice was not a personal idiosyncrasy of Aurangzeb’s either. Therefore, a more promising way of defusing the conflict potential which the mosque at the Kashi Vishvanath site carries, is to justify the replacement of the temple with a mosque. Maybe the owners and users of the temple had brought it on themselves? Maybe Islam can be disentangled from this act of destruction in favour of a purely secular motive? JNU historian Prof. K.N. Panikkar offers one way out: “the destruction of the temple at Banaras also had political motives. It appears that a nexus between the sufi rebels and the pandits of the temple existed and it was primarily to smash this nexus that Aurangzeb ordered action against the temple.” The eminent historian quotes no source for this strange allegation. In those days, Pandits avoided to even talk with Mlecchas, let alone to concoct intrigues with them. Other secularists have spread a more sophisticated variation, now regularly reproduced in the media: “Did Muslim rulers destroy temples? Some of them certainly did. Following the molestation of a local princess by some priests in a temple at Benaras, Aurangzeb ordered the total destruction of the temple and rebuilt it at a nearby site. And this is the only temple he is believed to have destroyed.” This story is now repeated ad nauseam, not only in the extremist Muslim press and in the secularist press but also in academic platforms by “eminent historians”. It is repeated with approval by historian Gargi Chakravartty, who also reveals the source of this story. “The story regarding demolition of Vishvanath temple is that while Aurangzeb was passing near Varanasi on his way to Bengal, the Hindu Rajas in his retinue requested that if the halt was made for a day, their Ranis may go to Varanasi, have a dip in the Ganges and pay their homage to Lord Vishwanath. Aurangzeb readily agreed. Army pickets were posted on the five mile route to Varanasi. The Ranis made a journey on the Palkis. They took their dip in the Ganges and went to the Vishwanath temple to pay their homage. After offering Puja all the Ranis returned except one, the Maharani of Kutch. The story is very bizarre, to say the least. First of all, it has Aurangzeb go to Bengal. Yet, in the extant histories of his life and works, no such journey to Bengal, or even any journey as far east as Varanasi, is recorded. Some of his generals were sent on expeditions to Bengal, but not Aurangzeb himself. There are fairly complete chronicles of his doings, day by day; could B.N. Pande or any of his quoters give the date or even the year of this remarkable episode? Neither was Aurangzeb known to surround himself with Hindu courtiers. And did these Rajas take their wives along on military expeditions? Or was it some holiday picnic? How could the Mahant kidnap a Rani who was there in the company of other Ranis, as well as the appropriate courtiers and bodyguards? Why did he take such risk? Why did the “Rajas” wait for Aurangzeb to take “exemplary action”: did they fear his anger if they punished the priests or destroyed the temple themselves? And since when is demolition the approved method of purifying a defiled temple, an eventuality for which the Shastras have laid down due ritual procedures? “There is a popular belief that Aurangazeb was a bigot in religion. This, however, is combated by a certain school. His bigotry is illustrated by one or two instances. The building of a mosque over the site of the original Kasi Visveswara Temple is one such. A like mosque in Mathura is another. The revival of Jazia is a third but of a different order. A story is told in extenuation of the first event. “In the height of his glory, Aurangazeb like any foreign king in a country, had in his entourage a number of Hindu nobles. They all set out one day to see the sacred temple of Benares. Amongst them was a Ranee of Cutch. When the party returned after visiting the Temple, the Ranee of Cutch was missing. They searched for her in and out, East, North, West and South but no trace of her was noticeable. At last, a more diligent search revealed a Tah Khana or an underground storey of the temple which to all appearances had only two storeys. When the passage to it was found barred, they broke open the doors and found inside the pale shadow of the Ranee bereft of her jewellery. “It turned out that the Mahants were in the habit of picking out wealthy and bejewelled pilgrims and in guiding them to see the temple, decoying them to the underground cellar and robbing them of their jewellery. What exactly would have happened to their life one did not know. Anyhow in this case, there was no time for mischief as the search was diligent and prompt. On discovering the wickedness of the priests, Aurangazeb declared that such a scene of robbery could not be the House of God and ordered it to be forthwith demolished. And the ruins were left there. “But the Ranee who was thus saved insisted on a Musjid being built on the ruined and to please her, one was subsequently built. That is how a Musjid has come to exist by the side of the Kasi Visweswar temple which is no temple in the real sense of the term but a humble cottage in which the marble Siva Linga is housed. Nothing is known about the Mathura Temple. So now, we finally know where the story comes from: an unnamed mullah friend of an unnamed acquaintance of Sitaram ayya’s knew of a manuscript, the details of which he took with him in his grave. This is the “document” on which secularist journalists and historians base their “evidence” of Aurangzeb’s fair and secularist disposition, overruling the evidence of archaeology and the cold print of the Maasiri Alamgiri, to “explode the myth” of Islamic iconoclasm spread by the “chauvinist” Hindutva propagandists. Now you just try to imagine what the secularists and their mouthpieces in Western academe would say if Hindus offered evidence of this quality. This entry was posted in Exclusivist religions, Hindutva, History, Nation and tagged Aurangzeb, Hindu Temple destruction, Kashi Temple on March 9, 2017 by arisebharat.